Arcane Vault had some great news a couple of days ago. 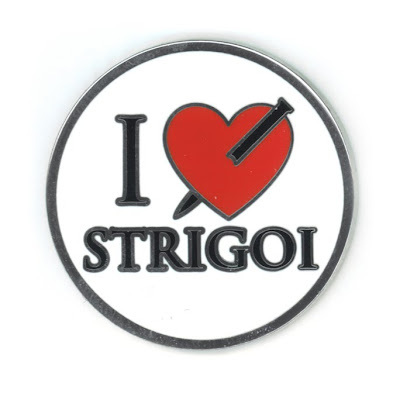 They've just released another one of the Vampire Academy pins, I stake Strigoi! You can order the I Stake Strigoi pin here. Also, Arcane Vault just hinted that they have some exciting news coming later in the week about something we (the fans) suggested to them. If you missed it, Arcane Vault asked us what kinds of merchandise we want to see from them. There were suggestions ranging from fake tattoos, tote bags and book ends, to blankets, bedclothes and pillows. I'm looking forward to seeing which of these suggestions they took to heart for this update.